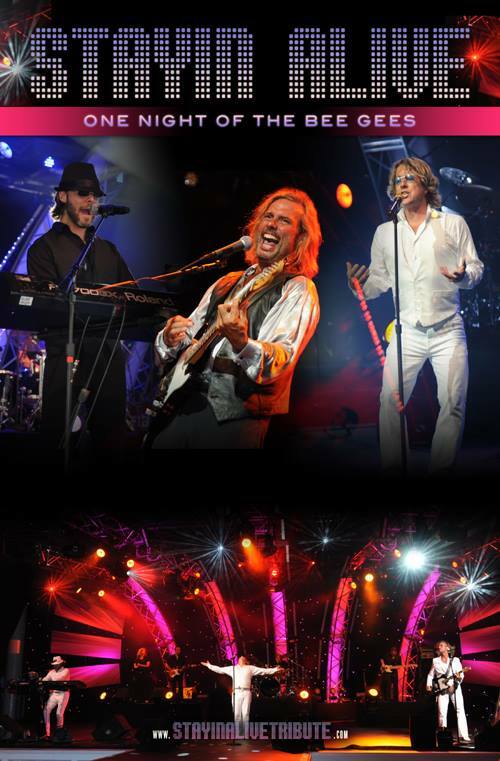 Stayin' Alive, with the vocal match of Tony Mattina, Todd Sharman, and George Manz, creates a realistic sense of hearing and experiencing the brothers’ Gibb live in concert. Stayin' Alive features a vocal trio, backed by studio musicians who wholly capture the sound mystique of The Bee Gees. Stayin' Alive offers to their audiences the songs and sights of a full Bee Gees play list. Singing blockbusters such as Night Fever, Jive Talkin, How Deep Is Your Love, You Should Be Dancin, Nights On Broadway, and Stayin Alive. In addition, they perform softer poetic ballads such as I Started A Joke, Massachusetts, Fanny Be Tender, Words, and To Love Somebody, among other great hits.